Home / The Archives / Project FiXootr: the "Stempost"
For those of you just tuning in: this post is part of a series chronicling my transformation of the Xoor Swift into a proper fixed-gear. The essence of the project, the rear wheel with fixed hub, is in the works. Until it arrives, I have some time to play with the bicycle as is, and see what I like. The first thing I did was replace the grips. 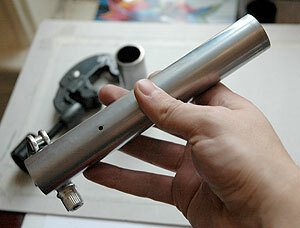 I didn’t like the ones that came on the bike, and had some sitting around from my old bike, which had a grip shift. The stock grip on the grip shift side was too short, leaving not enough room to put your hand down between the shifter and the end of the bar. That will soon be moot, but I had the grips laying around, so why not? One major concern I had at first was the height of the stem. 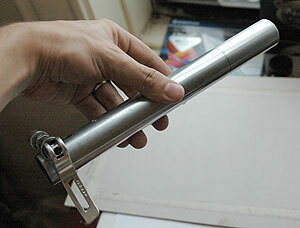 Not all folding bikes give you any range on where you can place your stem, and have it too high as a compromise. I think the Dahon Boardwalk is the worst offender here. I see people riding around on these bikes with their arms straight out in a “begging dog” position. I don’t ride like that, and I won’t stand for a bike that thinks I should. You can see how much extra stempost is sticking up above the stem. Now, I could ride the bike like this, but who wants to crash into a cab at 20 mph and regain conciousness with two inches of aluminum embedded in your groin? Not me! I’d much rather cut it off. And there you have it. A shorter stempost. 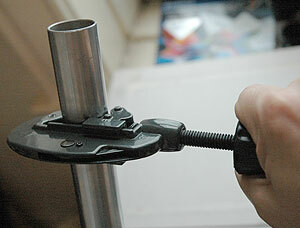 The rubber stopper goes back in the top, and the stem clamps right back on. I will more than likely be shortening the stempost again when I get the fixed wheel, since I will also be removing the derailleur, grip shift and rear brake, changing the whole look and feel of the handlebars. 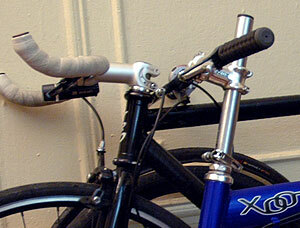 New and exciting handlebars means more pics, so stay tuned!